As promised, Blizzard has detailed the Basic and Classic Hearthstone cards which it will be re-balancing ahead of the arrival of the game’s new Standard mode next week, with explanations for why each change is being made from senior designer Mike Donais. 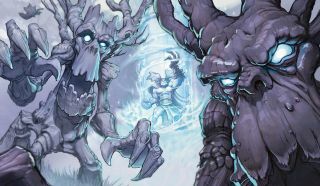 In total, 12 cards have been nerfed, with Druid hit hardest in the form of changes to three of its staple cards in Ancient of Lore, Keeper of the Grove and—no doubt to the delight of everyone who has grown sick of being smacked in the face by angry trees—Force of Nature. You can see all the cards being changed below. Aside from neutering the Druid combo, other commonly predicted nerfs include the neutral “tech” cards Big Game Hunter and Ironbeak Owl, which have both been accused of being fun-ruiners because they respectively counter high attack minions or those with powerful card text effects. Both have had their mana costs increased in a bid to reduce their utility. Aggro decks also take a slight hit, with stat reductions for Leper Gnome and Knife Juggler. In the case of the latter, I suspect it won’t be enough to stop it seeing played. The same can’t be said for Arcane Golem, which, as with the Druid’s Treants, has lost the charge effect, effectively rendering it unplayable. No surprise there, as Blizzard has long struggled to stop cheap Charge minions from being abused in obnoxious combos. Far more surprising is the change to Blade Flurry, the Rogue AoE spell. It now costs more and no longer does damage to the opposing hero’s face. Again, the aim is to reduce giant burst combos. We’ll have more detailed analysis of the changes from our resident expert Simon “Sottle” Welch soon, but it’s interesting to note that when we asked Andrey “Reynad” Yanyuk to predict 10 cards that would be nerfed, he called 5 of the ones that did get changed. Perhaps the most notable absence in the cards Blizzard picked to re-work is anything from the Freeze Mage archetype. Aggro Shaman also looks disgustingly powerful going into Standard, with Leper Gnome the only card altered, and powerful defensive tools from the Curse of Naxxramas and Goblins vs Gnomes sets, such as Sludge Belcher and Healbot, due to cycle out. These changes will come into effect as part of patch 5.0, the arrival of which will coincide with the launch of the Whispers Of The Old Gods expansion on April 26th. As ever, you’ll be able to disenchant changed cards for their full dust value for a limited period of time afterwards. Let me know in the comments if you’re happy (it being the internet, almost certainly not) with the nerfs. Which cards do you think escaped unfairly? Should any of the powerful legendaries like Alexstraza have been hit? Overall I’m as excited by the nerfs as I am the new cards, because so many of these cards had become auto-includes, or, like Master of Disguise, prevented other cool cards from being created. And, whisper it, but as a Druid main, I think we’ve actually got off kinda lightly.